Trends in the practice of SEO has changed a lot. In fact, it's getting changed always. Now Google focuses on the mobile friendliness of a site. And the impact of unique and useful contents has increase as well. Still there are some technical issues which you need identify and fix. Let's get an In-page analysis of your site . . . If you search google with the query - Free SEO Report, you will get thousands of free tools. But all of them are not effective, all of them are not reliable. I'm gonna introduce you with WebRank Page which I use very often. And you get these services for free! Visit WebRank Page > Enter your site's URL (i.e. markspcsolution.com) > Hit on the Analyze button. Just change the last part of the URL with your site's domain. Understanding the Result . . . Here you will see a lot of things. The blue factors indicate that you're okay. And the problematic aspects will be marked red. After you enter your site, the page will generate report on it. The first thing you will notice is a grade. It maybe A, B, C, D or E depending on your score. So far, Marks PC Solution scored C.
Just by the side of grading score, you will see the top 5 things you need to be fixed in your site. Next you will see SEO Report Summary - Successful and failed parameters. Basic Analysis will analyze your - Google Pagerank, Title, Meta Description, Meta Keywords, DocType, Encoding, Language, Load Analysis, Favicon, URL, Domain age and validity etc. HTML Code Analysis will examine your - Text/HTML Ratio, Headings, Images, Keywords, Tables, CSS, Flash, W3C Validity. Social Analysis will measure the strength of your site in social sites- Google+, Twitter, Facebook. Linking will count your internal and external links. Pages Indexed will show whether your site is indexed in Google and Bing. Visitor Analysis will show information based on Alexa. Security Analysis will show the security issues of your site. Whether it's listed on spammers' directory or affected by malicious software etc. Based on the report and your understanding, you may take corrective actions for your site. If you're a new blogger/ web developer, then you may not understand all the parameters. In that case, don't worry too much. Just fix the parts which you can do. And try to learn the other parts gradually. And don't be nervous about any part of the report. No page is successful in every aspect. Just try to improve always . . .
Webmasters today have a lot of free tools and services to monitor and analyze their sites. WebRank Stats is something like that which I use regularly. This site provides thorough information about your blog/website. Today I'd like to introduce you with this site . . .
A free service for webmasters, SEO practitioners and web users as well. As a webmaster, you can get detailed information about your site. SEO practitioners can justify their works comparing with other sites. And general web users can compare among the sites which they visit often . . . 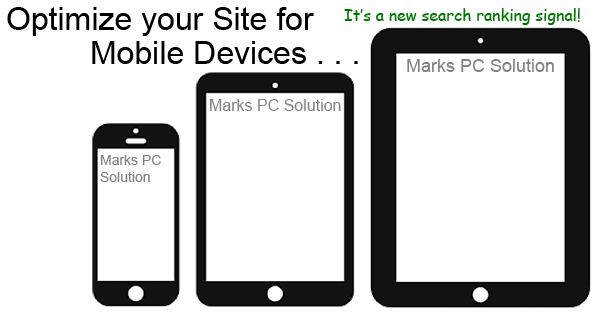 Suppose, our URL is www.markspcsolution.com. But you've to enter markspcsolution.com only. Now press enter to access to the stats page. Just change the last part of the above URL with your domain. What Information you will Get? 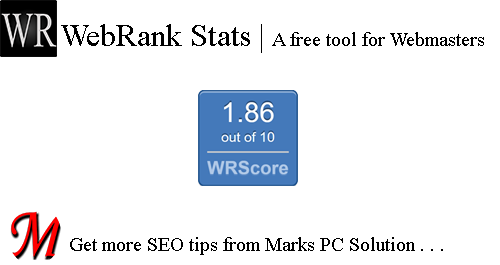 In fact, WebRank Stats integrate many other tools in its report. 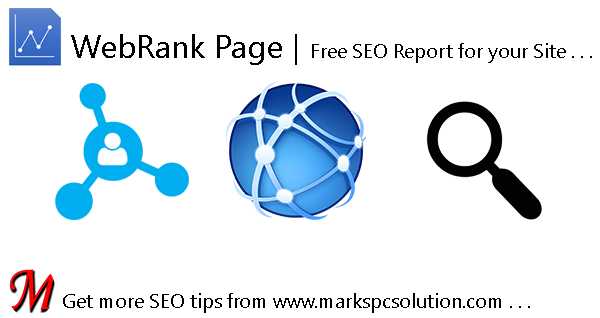 It collects data from major web services like - Google, Bing, Alexa, Complete, Quantcast, Similar Web, Facebook, Twitter, Google Plus etc. It has a scoring system like Google Page Rank. As you can see in the above image, our rank is 1.86 out of 10. Most of the time, this score matches with Google PR. General Information: This includes your Meta Description, Keyword, Sitemap, Text/HTML Ratio etc. Website Ranks: This will show the rank of your site in Google, Alexa, Quantcast & Complete. Website Safety: Is your website safe to browse? Here you can check it. Pages Indexed: How many pages of your site is indexed by search engines - Google & Bing. Backlinks: How many backlinks you've according to Google, Bing & Alexa. Sociometer: Your social performance on Facebook, Google Plus, Twitter, LinkedIn & StumbleUpon. Server Analysis: Your IP address, latitude, longitude, region etc. Traffic Graphs from Alexa, Complete, Unique, Quantcast etc. 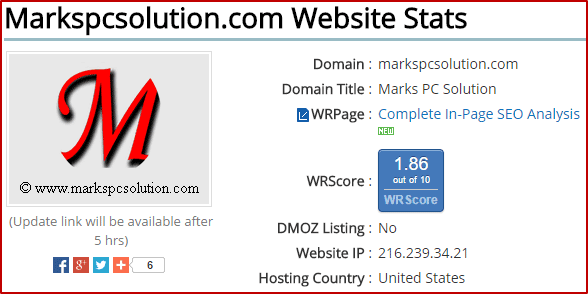 WebRank Stats has toolbar available for your browser. It supports Chrome, Firefox, Safari, Explorer and Opera. And it's really handy to use as a browser extension. WebRank stats is quite a nice service for the webmasters. But it has some limitations. Sometimes it may not display your rank properly. Suppose you've 20 backlinks on bing. But it may show your 0. Or you may have 2000 FB likes. But it may show more or less. But this problem is not a big deal. Hope all of you will enjoy this site . . .
Mobile-Friendly Sites Get Higher Ranking! Few days ago, when I signed in to my Google AdSense account, I got a notification - Your site's mobile-friendliness is now considered as a Google Search ranking signal. Before that I received an email from AdSense Team with the subject - Upcoming mobile-friendliness change in Google Search, is your AdSense site ready? After visiting the above link, enter your site's URL to the box. Now hit on the Analyze button to start the test. Within few seconds, you will get the result. If it says okay then you can relax. But if the test shows that your site is not mobile friendly, then you've got a lot of works to do . 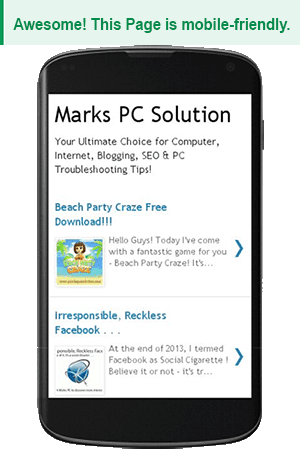 . .
How do you make your site mobile friendly depends on what do you use to maintain your site. Most of the webmasters use different CMS(s) to manage their websites/ blogs. Such as - WordPress, Blogger, Joomla!, Drupal, Google Sites, Tumblr etc. And not everyone is expert in all these content management systems (CMS). So, I can't provide solutions except Blogger. But there is nothing to worry about. You will get a complete Guide on Google Developers. I think this will cover most of the systems. And you should also know, sites which are hosted by Google Sites are already optimized. You don't need to take any action. You can simply take a test. If you're using Blogger, then the task is much easier for you. 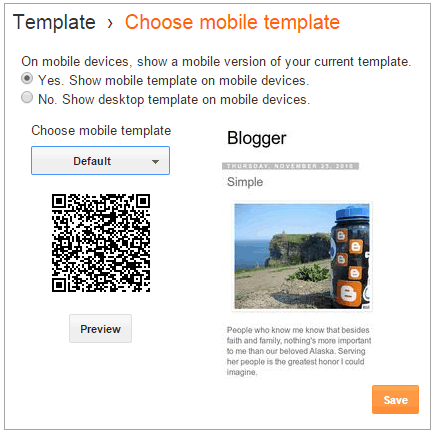 Blogger offers some default mobile-friendly themes. If you enable one of them, then you don't need to make any other changes! Hit on the Settings/ Gear icon under Mobile. Now look at the image below. Choose the same settings as exactly selected in the following image. Yes. Show Mobile Template > Choose Default Mobile Template > Hit the Save button. If it seems that your mobile look is very simple but you want a colorful one, then you can choose other templates available below the Default Template. And those templates are also mobile friendly. But you must take the test after choosing the template. If you choose the Custom template from the list, then your desktop template will be adapted for mobile devices. But it may not work fine while viewing your site on a mobile device. But if you find your custom template is working fine, then you can use it. Many of you maybe already familiar with the Web Developers' SEO Cheat Sheet created by Danny Dover. It's really a nice sheet which contains some crucial SEO tips for the webmasters. In this post, I'm gonna share The Web Developer's SEO Cheat Sheet 2.2 with you. It's been last updated in February, 2014. I've uploaded the file to Google Drive. It's completely free download without any adware or malware. Unzip the folder and store the PDF file in a safe place. Enjoy the SEO tricks . . . Important HTML Elements i.e. Title Tag, Meta Description, Hyperlinks etc. Important Links i.e. Webmaster Tools, Developer Tools etc. This is only a 4-page PDF file. But it contains so many information that some of them I've never applied. So, use these codes or techniques in your own responsibility. If you face any problem, of course share with us . . .
Hello bloggers! Hope you're doing fine in blogging. 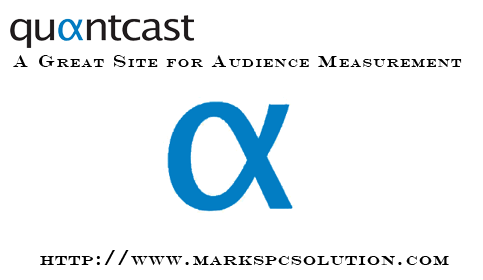 Today I'm gonna write a review on Quantcast. Actually quantcast is a great site for audience measurement tool. You can collect huge information through Google Analytics. But I think Google Analytics is too heavy and sometimes it's really difficult to use. In that case, quantcast is more comfortable and convenient for the webmasters. Quantcast is also capable of showing the real time situation of your site worldwide! Yes! Just like Google Analytics, quantcast can fetch your real time visitors through world map. Thus you can see who is in your site right now. Do you use Web Rank Toolbar? I've found quantcast from Web Rank Toolbar. Earlier whenever I opened Web Rank Toolbar in Iron Browser, I saw my site is not ranked by quantcast. Because quantcast only measures your site when you set up its code in your site. Just replace the red part of the URL with yours. Now go to this address. Check your site's rank if available. And also look upper right corner. You will see - Not quantified. If your site is already qantified then you will see Quantified button. In order to get quantified, you must have an account with quantcast. I know most of you have no account qith quantcast. First open an account there and follow the steps below. Look at the right panel - Add a Website. Hit on it. A new window named General Tag will pop up. Copy the code from Your Tag and paste it just before the </body> tag in your site. Now hit on the Submit Site button. Wait for a few days. You will get an email notification when your site gets quantified. Directly go to Blogger Dahsboard/ Control Panel > Now go to Template > Edit HTML > Press Ctrl + F within HTML Layout > type </body> > Place the copied code just before the ending body tag. That's it. You can also check - Working with New HTML Template Editor. Here you will learn, how to work with the new HTML template editor of blogger. Hey bloggers! Hope you're running your blogs fine. Today I'm gonna share a simple related posts widget with you. You know how important it is. A related posts widget can retain your visitors. It helps to increase visitors' engagement with the site. Have you noticed, when you visit a site to know something and get a related post just at the end of that post you also read the related post! Let's consider my own case. Few days ago I visited My Blogger Tricks to know something. At the end of the post there were 05 related posts. I've also read one of those related posts. From that post, I discovered another posts which I like! After reading the 03 posts from that site, I've used the search option to find another post. And this only happens due to the related posts widget. Instead of one pageview, My Blogger Tricks got at least five pageviews from me. And I spent almost an hour on that site! Can you imagine? One hour instead of five minutes. And this is exactly what Google wants. Sign in to your blogger account and go to the dashboard. Copy the following code and paste it in the Content box. Save the Widget and View your site. Note: This widget may slow down your site's loading time. WordPress, you know, the most sophisticated platform of blogging. It has both free and premium versions. But free version doesn't let you customize the theme or edit CSS. That means, if you don't go premium, you can't edit the code of your WordPress site. But WordPress allows you verify the site in Google, Bing & Yandex through Website Verification Services. Last year, I published a post on Blogger Vs. WordPress. If you're interested to know more about blogger and WordPress, you can have a look. What WordPress Says about Site Verification & SEO? WordPress provides enough information about your site's traffic. But if you would like to know more, then you can verify your site in Google or Bing Webmaster. Though it's not necessary to verify your site to be indexed by Google, Bing or other search engines. WordPress itself takes care of your site and it does all necessary SEO for you. 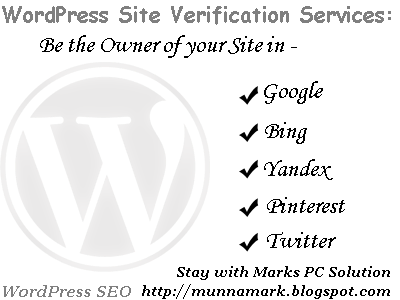 When you publish new post, WordPress automatically sends data to search engines. WordPress themes are search friendly too. All you need to do - is just blogging. And the verification process is almost similar for Google, Bing, Pinterest & Yandex. But to be indexed with Twitter Website, you must be a premium member. Hit on Tools > Available Tools. Here you will get all the verification options. You just need to collect the meta tag from Google, Bing or Yandex. And place it in their respective fields. Finally hit on the Save Changes button. Sign in to your Google Webmaster Account. Hit on ADD A SITE button. Paste the code in Google Webmaster Tools option of WordPress verification page and save it. Now back to the verification page and hit on the Verify button. If everything is okay, you will get a confirmation message. That's it. Sign in to your Bing Webmaster Account. Hit on Add a Site. Enter your site's URL and hit on Submit button. Again go to your WordPress site verification page and paste the code in Bing Webmaster Center box. Save it. Back to the Bing Webmaster Verification page and verify your site. Most of you are not familiar with the name Yandex. Actually this is a search engine like Google or Bing. And it's a russian search engine. It has a mail service too! It's known as Yandex Mail. Sign up for a new Yandex Account. Or login to Yeandex Webmaster if you already have an account with Yandex. Hit on Add Site button located just below the Webmaster heading. Enter your URL in the box and click Add button. You will get several verification methods- HTML File, Meta Tag, Txt File etc. Now go to your WordPress Dashboard Tools page > paste the code in Yandex field > Save Changes. Back to your Yandex Verification page and hit on the Check button to verify. Within few seconds your site will be verified. You can see the site verification option to check the verification status. Load the page properly - don't stop it. You will get a Pencil icon at the bottom right corner of your profile. Hit this icon. Here you will find a Website field. Enter your site's URL here. Now hit on the Verify Website button > Choose Verify with a Meta Tag. You will get a meta tag. Copy the content part only. Go to your WordPress site verification page and enter the code in the Pinterest field. Click on Save changes button. Get back to the Pinterest verification page and click on Complete Verification. If verification is successful then you will see Site Verified mark after your URL. I think, verifying in Twitter is not necessary. Still if you think of adding your site in Twitter, you should be a premium member. But you can easily add your site in your twitter profile. It's free! Search engines run the world. Internet world is useless without search engines. You may argue that Facebook is not a search engine. But it's a big search engine. Facebook needs to search appropriate person, place or group for you! When you need to find something, we usually search this either in Google, Bing or Yahoo. But a tiny blog or website should also have a search engine. Most of the websites and even blogs have a search option. It makes easier to find something in your site. And it could be also helpful for you to search something on your site. In Marks PC Solution, there are more than 300 posts so far. Being the author of the site, sometimes I forget what topics are published here! So how do visitors get something without search box? 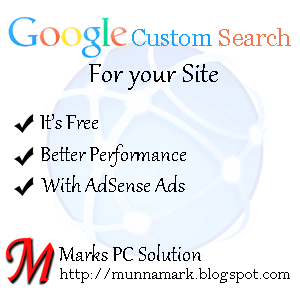 Visit and sign in to Google Custom Search Engine home. Hit on the Add button to create a new engine. Hit on the Create button. Done! If everything is okay, you will get a confirmation message. Hit on the Get Code button to get your search engine script. Hit on the Public URL to view your search engine page. Hit on the Control Panel to edit your search engine settings. First you've to select your search engine. Then go to Setup > Basics > Details > Get Code. Copy the script and Place it in your template properly. Example: You've to place the code within the <body> </body> tag. See the structure below. And choose a proper location where you wanna setup the search box. There are different options to customize your search engine. You can go to every option and change settings if necessary. First you can start with Setup option. Here you will get Basics, Make Money, Admin, Indexing etc. You can rename your search engine, give it a description, provide keywords, change language and add more sites to include in your search engine. In the Make Money option, you can add your AdSense account here. If people use your search box and hit on Ads by Google, you will be paid through AdSense. In Look and Feel option, you can change the layout and theme. In the customize option, you can change everything as you wish. In thumbnail option, you can choose whether pictures appears with search or not. I'm not going to extend the post. Because this post has already crossed 600 words! This is a simple topic. I would like to stop here. Explore the custom search engine page and find the features by yourself. And I'm waiting to reply any question from you. Don't forget to leave comments . . .
More or less, all internet users are informed about the URL (Uniform Resouce Locator). A URL is simply the address of a site in internet. With the help of URL, you can directly access to a particular site. While general people just need to know the URL only to access a site, webmasters have to perform lots of tasks with it. Webmasters need to create thousands of links through URLs. Time to time they need to check the site's status through URLs. But these are not my concern in this post. Today I'd like to discuss about how to inform Google when you change your site's address. When a site gets a new address/ URL, definitely it loses social sharings. All backlinks of the site will also be lost. And search engines will not entertain that site as before. Because you're simply a stranger to them! Search engines even don't know about your site until you submit it for indexing. You must have an account on Google Webmaster. You should have sufficient knowledge to handle Google Webmaster Tools. Both your old and new sites should be added and verified in Google Webmaster. You can easily recover your search ranking position. It's safe. Because only verified site owners can use it. Google will index your site quickly. On the Homepage, click on the site that you wanna work with. Click on the drop down arrow by the side of Gear icon (Look at the above image). After completing steps 1 - 3, click Select a verified site (Your new site). That's it. Changes will stay in effect for 180 days. Both of your sites are added and verified in Webmaster Tools. You haven't already requested for change of address. 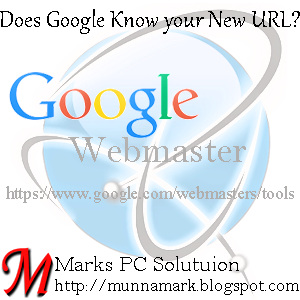 For more details, please read Webmaster Tools Help - Tell Google when your site moves . . .